Amanda Brambila is now a molecular, cell and developmental biology doctoral candidate at UC Santa Cruz, but she started as a community college student commuting across the border from Mexico every day. There, a professor encouraged her to join a National Institute of Health summer program that submerged her into the world of research. 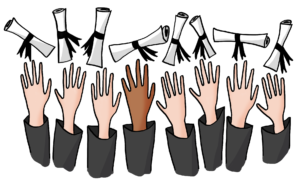 Students of color are and have been systemically underrepresented in higher education, but in graduate schools the gap in diversity widens further. Without having grown up around people who have post-graduate degrees, getting to and succeeding in graduate school as a traditionally marginalized student can be a different experience from those of more privileged students. Graduate students are influential in encouraging undergraduates to go to graduate school, becoming leaders in their fields, for example as professors. People of color and other underrepresented students also bring diverse perspectives to research and their fields. Currently, UCSC’s undergraduate population is composed of about 31.4 percent white, 27.6 percent Hispanic/Latino and 4.2 percent African American students. In graduate school, the percentage of white students increases to almost 40 percent, while Hispanic/Latino make up 10.7 percent and Black 3 percent. Underrepresented ethnicities showed “very small gains” in graduate school composition since 2009, according to UCSC graduate admissions statistics. Lack of diversity in research and education can have tangible consequences. For example, the human papillomavirus (HPV) vaccine targets strains most commonly seen in white women and doesn’t account for genetic variation with different types of vaccines. New research is now being done to create a new vaccine that would focus more on including African Americans in clinical trials and research studies. Although enriching the overall environment of graduate school and quality of research being done is important, the conversation surrounding diversity tends to touch on how it benefits those from non-diverse backgrounds. But that’s not why underrepresented students attend. Underrepresented students often come to graduate school with help from programs like the National Institute of Health summer program, which Amanda Brambila participated in. These focus on mentoring students by helping them understand the requirements for successful graduate applications and get experience in research, which is often required before entrance to graduate schools, especially in STEM fields. Once at graduate school, things like microaggressions and imposter syndrome can also get in the way of success. Because of this, she and Johnson stressed the importance of having a community of people of color to support each other and bring more students of color into graduate education spaces. To foster this community, UCSC Society for Advancement of Chicanos/Hispanics and Native Americans in Science (SACNAS) of which Amanda Brambila chapter president, is starting to outreach to middle and elementary school students from low-income or predominantly Latinx schools. Achieving diversity in graduate schools begins with encouragement, and starting at a young age can decrease difficulties and increase achievement for underrepresented students in graduate schools.